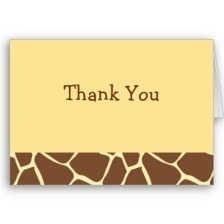 These adorable Giraffe print note cards are great for every day note cards or as thank you cards for baby showers or birthdays. Customize with your own text! Matching invitations, envelope seals and postage stamps available in our store.